Batting stars: Marwin Gonzalez was 2-for-4 with a home run. Jorge Polanco was 1-for-3 with a home run (his third) and a walk, scoring twice. Eddie Rosario was 1-for-4 with a three-run homer, his fourth. Pitching star: Tyler Duffey struck out three in two shutout innings, giving up a hit and a walk. Opposition stars: Eric Sogard was 3-for-5 with two runs. Justin Smoak was 1-for-3 with two walks and two RBIs. Randal Grichuk was 0-for-2 with three walks and two runs. The game: The Twins threatened in the second, getting one-out singles from Gonzalez and Jake Cave, but did not score. They got on the board in the third, however, as Polanco hit a two-out home run that gave the Twins a 1-0 lead. Twins starter Kyle Gibson sailed through the first five innings, giving up just one hit. He hit the wall in the sixth, however. Danny Jansen led off with a single and Sogard doubled. Freddy Galvis struck out, but a walk to Grichuk loaded the bases and Smoak delivered a two-run single that put the Blue Jays up 2-1. Ryne Harper came in and got Teoscar Hernandez to fly out, but then gave up RBI singles to Rowdy Tellez and Alen Hanson to make the score 4-1. The Twins came right back in the bottom of the sixth. Walks to Max Kepler and Polanco opened the frame, and Rosario followed with a three-run homer to tie the score 4-4. Unfortunately, the tie was also short-lived. Trevor May started the inning for the Twins. A Sogard single and walks to Grichuk and Smoak loaded the bases with two out. The Twins brought in their designated Bases Loaded Pitcher, Trevor Hildenberger, but this time he could not get it done. Hernandez singled, scoring two runs and putting Toronto back on top 6-4. To their credit, the Twins did not roll over. Gonzalez started the ninth with a home run to cut the lead to 6-5. Nelson Cruz walked, but a force out and a strikeout left C. J. Cron on first with two out. Byron Buxton delivered a double to deep left, but Cron was thrown out trying to score from first and the game was over. Notes: Polanco is batting .415. Mitch Garver was 0-for-1 and is batting .407. Harper gave up a pair of run-scoring singles, but neither run was charged to him, so his ERA is still zero. Hildenberger and Duffey, who was making his season debut with the Twins, also have ERAs of zero. Rosario was the DH in this game, with Jake Cave in left and Cruz on the bench. Willians Astudillo was at first base, with Cron on the bench. Ehire Adrianza was at second base, with Schoop on the bench. While this may have been overdoing it a little, I like the fact that Rocco is using his entire roster. Yes, it lessens your chances of winning that particular game, but it keeps everybody fresher, more rested, more ready to play, and should result in more wins down the line. That's the theory, anyway. I don't know if anyone has been able to discern any particular pattern in who catches each game. I haven't had time to examine it--is he using certain catchers with certain pitchers, going by opposing pitcher matchups, or what? I think there must be a pattern--I don't believe Rocco's just choosing at random. I just don't know what it is and haven't had time to try to find out. I wasn't able to pay attention to last night's game, so I don't know if we had Nibbly Gibson or not. If we did, it was pretty darned effective nibbling for five innings. I know the e coli excuse starts to wear thin for people, but it's a pretty severe thing, and some people take longer to recover from illness than others. Given that he was cruising for five innings and then just suddenly lost it in the sixth, I don't think it's unreasonable to think that fatigue might have been a factor. On the play at the plate to end the game--well, again, I wasn't watching at the time, and it's pretty easy to second-guess after you know the outcome. As a general principle, though, I don't have a problem with aggressive baserunning, as long as there's a reasonable chance for success. Sometimes you have to force the other team to make a play. When you do, sometimes they'll be able to make it. And when that happens, you just give them credit and move on. No team ever went through the whole season without a two-game losing streak, and the Twins won't be the first. The trick is to keep the losing streaks short. Record: The Twins are 8-6, in second place in the American League Central, a half game behind Cleveland. Projected record: We'll just have to settle for 156-6! it's kind of weird reading about games in this format without knowing the end of the story. I don't know if anyone has been able to discern any particular pattern in who catches each game. I haven't had time to examine it--is he using certain catchers with certain pitchers, going by opposing pitcher matchups, or what? The shine has worn off of Astudillo for now; I don't see the need to put him in every position on the field where there are other good choices on the bench. There are other good choices, right? 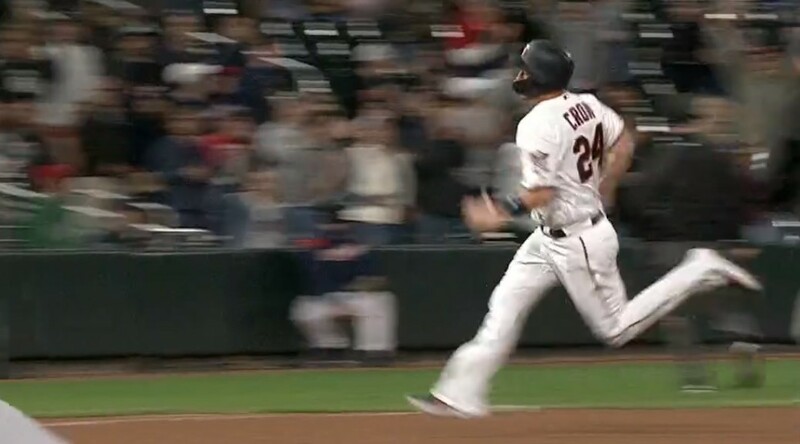 Am I the only one who saw Cron heading into third and looking like an 18-wheeler that missed a shift? That's specifically what the header image is.